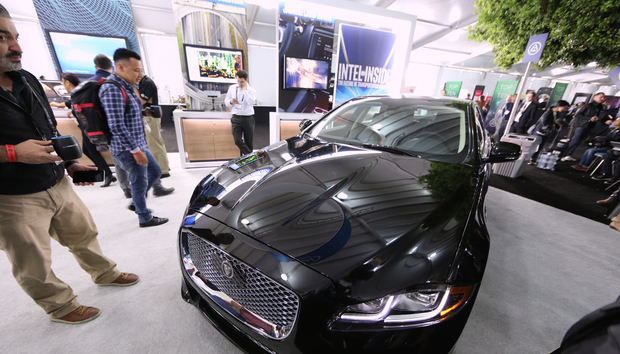 As the PC market levels out, Intel believes it has a big future in autonomous cars. It's the new hot market the company is chasing, much like it did with mobile devices in recent years. Autonomous cars are so significant to Intel that the company on Tuesday said it is establishing the Automated Driving Group, which will focus on developing hardware and software technology for self-driving vehicles. Intel has already acquired a handful of companies developing autonomous vehicle technology. Intel has also partnered with BMW and Mobileye to put an autonomous car on the road in 2021. Earlier this month, Intel said it would invest US$250 million over the next two years to develop autonomous cars. The division will be headed by Doug Davis, who currently is the senior vice president and general manager of Intel's internet of things group. Davis was headed to retirement from Intel by the end of 2016, but that's been delayed. Davis' new title will be senior vice president and general manager of the Automated Driving Group. The Intel IoT group will now be led by former ARM executive Tom Lantzsch. The Automated Driving Group will hit the ground running. The chipmaker will ally with Delphi and Mobileye to create autonomous vehicles, a spokeswoman said. Those vehicles would use Intel chips. For now, Delphi and Mobileye will use Intel's Core i7 chips but will switch over to an upcoming chip. Beyond chips, Intel is also developing sensors and connectivity, safety, and machine learning technologies. Intel also believes autonomous cars will indirectly aid the company's server business. Intel CEO Brian Krzanich has estimated cars will generate 4TB of data a day via images from cameras and data from sensors like radar and lidar. Servers in the cloud will help with image recognition, navigation, and other regular driving tasks. But Intel faces a lot of competition. Nvidia's chips power vehicle infotainment and navigation systems and will be used by companies like Volvo and Audi to build autonomous cars. NXP -- which is being purchased by Qualcomm -- provides parts for car control systems. Qualcomm owns the modem and telematics markets. This isn't Intel's first swing at the automotive industry. In the mid-to-late 1980s, the company supplied chips for control systems to companies like Ford but moved away from embedded chips as the PC market took off. Intel has a stack of modems and chips but is still far behind the competition, said Jim McGregor, principal analyst at Tirias Research. The autonomous car market will be worth billions of dollars and grow quickly, so many companies will be able to profit, McGregor said. Right now, the opportunities are still hard to measure, he said. There will also be growing markets for other models of autonomous vehicles and watercraft and supplemental markets that could make it easier for smart cars to operate on the streets, McGregor said. "If we have a smart car, we need to have a smart [transportation] infrastructure," McGregor said.